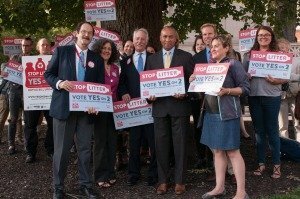 September 24, 2014— Governor Deval Patrick today enthusiastically threw his support behind the effort to update the Bottle Bill and pass Question 2 on the November 4 ballot. 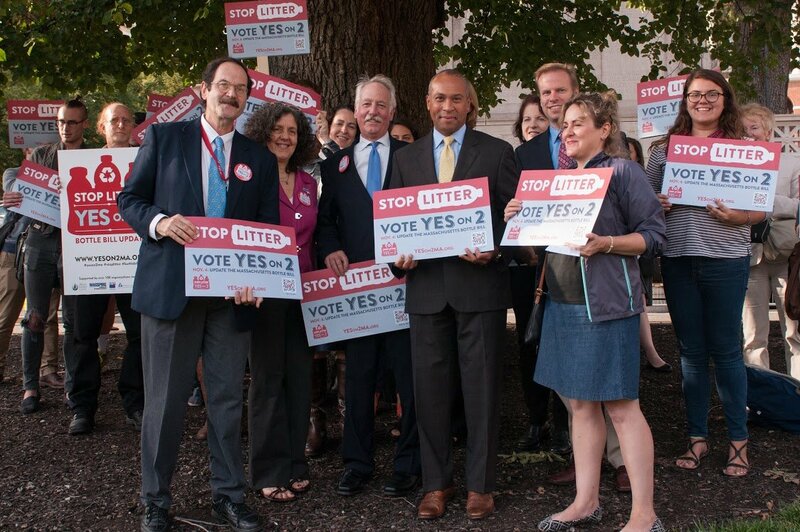 Governor Patrick endorsed STOP Litter: YES on 2, the grassroots campaign to add water bottles and sports drinks to the existing five-cent bottle deposit law. The Governor joined environmental and civic groups in supporting YES on 2, including the League of Women Voters of Massachusetts, represented by co-president Anne Borg. Governor Patrick has championed a range of environmental causes throughout his time in the corner office, including climate change action and making the state a leader in clean energy. Patrick said a Yes vote on Question 2 would go far to clean up Massachusetts. “When I first ran for governor, we emphasized the need for friends to talk to friends, and neighbors to talk to neighbors to spread our message and help grow our campaign. I urge supporters of YES on 2 to do the same, to tell everyone that YES on 2 will increase recycling, clean up our parks and save cities and towns money,” said Patrick. A yes vote on Question 2 on the November ballot will update the successful 32-year-old Bottle Bill, and put the five-cent deposit currently on soda and beer bottles on bottles of water, iced tea and sports drinks. Any unclaimed deposits will go to a state fund earmarked for recycling and environmental purposes. Many local and state organizations have endorsed Yes on 2, including Sierra Club, Mass Audubon, Environmental League of Massachusetts, League of Women Voters of Massachusetts, and MASSPIRG. The Updated Bottle Bill has also been endorsed by 400 small businesses, and 209 cities and towns passed resolutions in favor of it. Updating the Bottle Bill will save cities and towns approximately $6.7 million a year—or an average of $1 per person in our state—in litter pick up and trash disposal costs. It also will mean less waste going to landfills and incinerators.